LOS ANGELES – J.J. Redick got hot in the first quarter and the Clippers went into cruise control from there beating the Boston Celtics 102-93 on Monday afternoon. DeAndre Jordan led the team with 19 points, 12 rebounds, two steals and six blocks and helped them pull away in the fourth quarter when the Celtics got within three. Redick hit three triples in the third quarter, stretching the lead to 23 at one point before the Celtics closed the quarter on a 13-3 run. Blake Griffin had 22 points and 9 rebounds and Jamal Crawford added 16 points off the bench for the Clippers, who have now won two consecutive games and can move into a tie for fourth place in the Western conference depending on the outcome of the Dallas Mavericks and Houston Rockets games later today. Brandon Bass had 17 points, Marcus Thornton 15, Jared Sullinger added 14, Kelly Olynk 11, Evan Turner had 10 points, 10 rebounds and 6 assists and Oklahoma State rookie, Marcus Smart had 14 points and 7 assists as the Celtics had six players in double figures including four off the bench. Tayshaun Prince who was acquired by the Celtics on Friday in a trade that sent forward Jeff Green to the Memphis Grizzlies, made his Celtics debut and scored two points while playing almost 20 minutes on the court. 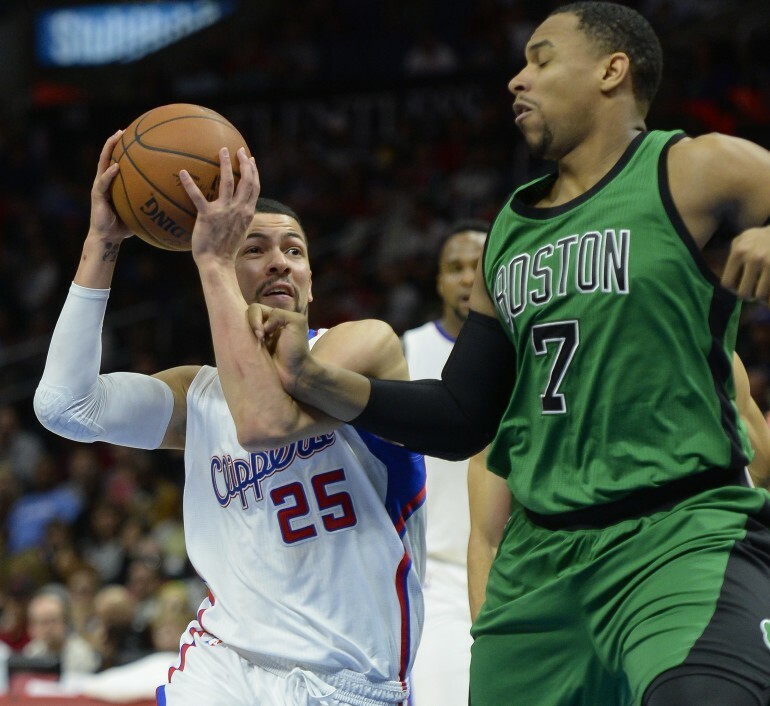 The Celtics got within three points midway through the fourth quarter after Thornton hit a three, but Clippers head coach Doc Rivers reinserted his starters back into the game and Los Angeles finished on a 12-3 run to close out the C’s. The Clippers played a rare afternoon game on the NBA’s Martin Luther King Jr. Day slate of games. The Clippers and the NBA joined together at halftime to play an emotional black and white video montage of the diversity in the NBA from Chuck Cooper in 1950, to Jason Collins in 2014. The inspiring montage ran over MLK’s “I Have A Dream” speech and concluded with the word “Dream” next to the NBA logo. The Celtics have lost 24 consecutive games to Western Conference opponents dating back to 2013 when Doc Rivers coached the team. Austin Rivers scored his first basket as a Clipper and he did it against his “former” team. Rivers stepped on the court for the Celtics, but technically was a member of the team for 48 hours.